If your service has one or more rooms, then each room has its own planning area. Learn more about room planning here. You can move a plan from where it was created to any of these other planning areas. 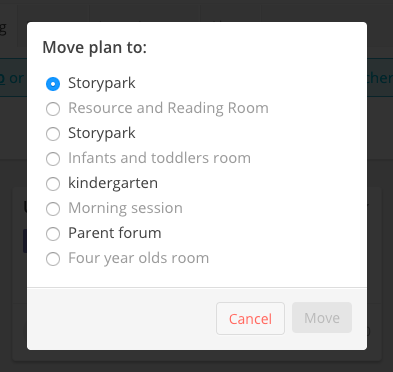 You add a new room to your profile and want to move plans created in a different area to the new room. You want plans about a child to travel with the child when they move rooms. 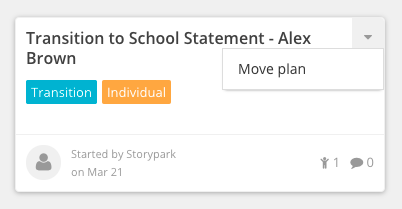 Tap on the small drop-down arrow in the top right of any plan, and select 'Move plan'. You'll see a list of rooms that you can move your plan to. Select any of these and then tap 'Move'. The plan will now be in the group that you selected. Why can't I select my room? If a room is disabled it is because the plan you're trying to move has children in it that are not in the room you're trying to move it to. If you try selecting it you'll see a message that explains why and what to do about it. Check which children are in your plan and add them to the room you're trying to select. Or, remove any children from the plan who aren’t part of the room you're trying to select. Bear in mind though that if your plan has been shared with parents this will remove their access as their children are now not attached to the plan.